My little Aquarius, almost Valentine pup, turned 10 years old on February 15th! Yep. This crazy dog lady is writing about her pup, again. No need to continue reading if you just can't handle another gushfest. If you care to continue here's the story about how I came to be the proudest GSP owner. What follows is the story about the day that Pippin picked me. This decade old love affair began in a dingy basement in Waynesboro, Virginia. If you're familiar with Waynesboro that line could easily double as the intro to a horror film. This, fortunately, is instead the intro to a tale of two friends that includes very little horror unless of course, you're a groundhog. During my stint at school in Florida, my parents had the misfortune of biding farewell to both of my childhood dogs. Zach, a handsome and loyal Black Labrador and his shadow of a sidekick, Heidi the Weimaraner. It was unbearably hard to be away from them especially in the end. They were the best of the best. Everything and more than you would want from two pups. After mourning their loss' and living dog less for the first time in many many years they had finally decided it was time for another. I had since moved back to the area and agreed that they were ready to start the hunt for another loyal companion. 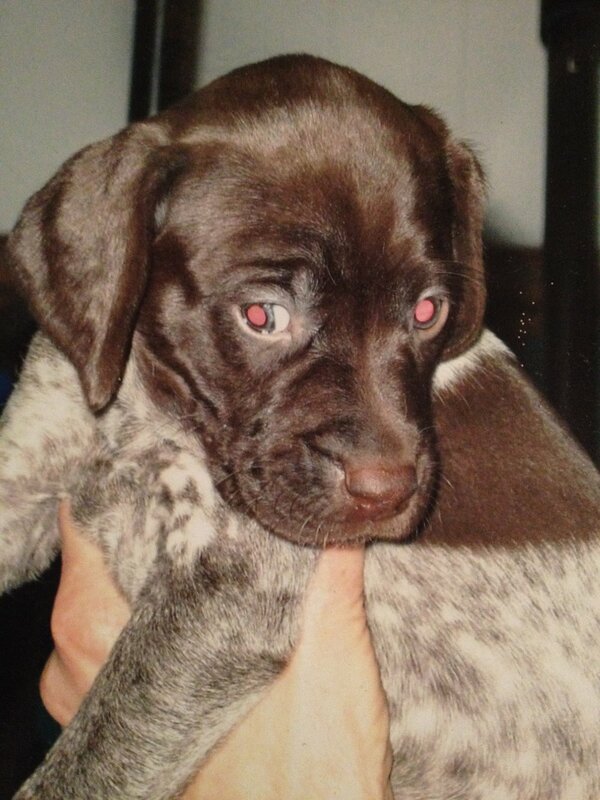 They were hoping for a German Shorthaired Pointer, at least that's what I remember my mom saying that she wanted. And that of course meant that they would be getting a German Shorthaired Pointer. It was the Spring of 2008 and mom found an advertisement in the classifieds for GSP puppies. How exciting! They invited me along to go check them out. They were too young to go to their new homes but we could go take a peek and if the stars aligned, I could help my folks pick out their new dog. Keep in mind, I had zero intention of getting one of my own, seriously. I've said it before, but I could barely take care of myself at that point and the little bit of effort I did put in was just that, very little effort. I couldn't imagine the responsibility that came along with another life. Off we went, over the mountain to Waynesboro, to look at puppies! For some reason I remember that my mom was very specific about what she wanted; a male, one that was white with brown (liver) spots. I was sort of thinking that the right one would probably pick them whatever color it may be. But what did I know? I'd never done this before. I mean, I had been present when our family had gotten our previous dogs but I don't remember how that had gone down, I was maybe eight years old. About the only thing I can guarantee is that my opinion probably wasn't a deciding factor. We arrived to a brick rancher in an established neighborhood in the heart of Waynesboro. In my mind we were heading to a farm. I guess that was just the first part of the story I had created in my mind. We were greeted at the front door and instead of heading to the backyard where we saw and heard dogs we were invited inside and ushered to the basement. The basement?! Again this is not part of the story I created in my mind. But off we went, down the stairs to the basement, something I would probably only do for puppies. In the basement were large cardboard boxes full of puppies. And again, another part of this story that had not existed in the one I had imagined. But there they were, the cutest spotted pups, in boxes, weird. It helped contain them, I get it. I tried to overlook the boxes. We gushed and giggled and somehow managed to free them from the confines of the boxes to get a better look. My parents were honing in on the boy pups and I took an immediate attraction to a wayward little girl. Upon her release from the box she made a beeline for cover under a nearby sofa. She seemed to be planning her escape from the basement (me too) and so naturally I had to help her make this happen. I was done looking. This wayward little girl was the one my parents needed. The only problem? She wasn't a boy and she did not have the markings my mom was drawn to. Instead of white with liver spots she was mostly liver, with ticking and liver spots, but in my eyes, she was perfect. Canine perfection. I was sold. And that part was definitely not part of the story I had imagined in my mind. As we all know, sometimes the truth is stranger than fiction. I don't remember much of what happened next. We were released from the basement (thank goodness!) and left saying something like, "we'll be in touch..." I do remember how much that sweet little girl spoke to me. I suppose the universe was working a favor for both of us and we just didn't realize how that would play out yet. Like most things, in retrospect it is all so crystal clear, we were made for each other. The next part of this story that I can recall with clear recollection was my dad calling the man who had the puppies and asking him if he'd give him a deal if he bought TWO puppies. Whaaaaat?! Two, are you nuts? Why? He got off the phone and basically told me that he was giving me a puppy! Excitement, fear, elation, and anxiety were just several emotions I remember having about my impending new responsibility. Even if said responsibility was the cutest puppy ever, I was terrified. I was broke as a joke and spent all my money on takeout and alcohol. A dog? Dog food? A veterinarian, good gracious. I'm still not entirely sure how but somehow with our powers combined we've made it a decade. We both started off without any gray hair and now we both have more than we can count. Ten whole years later, lots of hard times, the very best of times and countless stories later, Pippin remains the very best gift that I have ever received, ever. She's neurotic and has way too much energy for her own good but somehow her crazy mixed with my crazy has created the most perfect storm. I wouldn't have it any other way. We've been celebrating all month long and I promise you that every day I get the gift of being her person I swear to make her day as perfect as she is. All the walks, all the mud wallowing, all the treats, whatever my girl wants, my girl gets. Lord knows she's earned it. Pippin, cheers to you and here's to many more adventures and cuddles together.